Once in a while a headphone comes along that costs very little but hits way way way above its own weight and into the realm of some much pricier competition. In this case we have the SR-850 which has been 2p modded and cup clearance modded to produce impressive open sound for audiophiles on a budget. Standard fare here comes in a retail box with good graphics and info on it, completely inoffensive cheap and to be honest a tad boring. Not much to talk of here you get a Jack adapter and thats about it, a carry bag might of been a nice inclusion however these are open headphones so probably wont be traveling with you anyway. The looks are good, i like the style and its fair to say the are a blatant rip off of the much pricier AKG K240. Similarities with the AKG end there though as the samson are far cheaper feeling to the touch with a lot of thin plastic. However despite this they are actually reasonable well made and mine have held up for over a year now even if the don't see as much use. The pads are vinyl and pretty nasty, ears will get sweaty under this one and many users have performed a 'sock mod' on these to improve comfort myself all I have done is place some rubber under the pads in order to raise the drivers from my ears a few mm's. No problems here at all other than, as mentioned, ears tend to get a little hot from prolonged use. 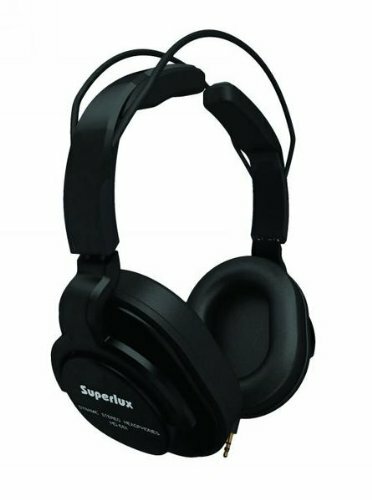 The samson uses a full vinyl headband instead of the wings used by the OEM Superlux's and benefits greatly from this adding both stability and comfort. After a hearty 100 hours of burn in just to be on the safe side I can say that the sound of the Samson's far outweighs the price tag which it wears. It is open airy and to a great degree very neutral sounding. On open box they come across a tad sibilant but do tame down after some burn in and this is further helped with the addition of the 2p mod which basically involves taking off the name caps on the left and right side and glueing a 2p coin to each side. Essentially this is mass loading behind the drivers thus reducing some resonance from the slightly thin plastic..
Everything else mids lows and highs are very well balanced detail retrieval is great at this price point and soundstage (in large thanks to the open back design) is impressive. In practical terms to get this sort of result you should be spending closer to £100 than the £35 that these can be picked up for. At £30-£35 the Samson SR-850 can be considered as a certain bargain and would be an excellent starting point for anyone looking to see what high end sound is all about, it does everything very well and all that more expensive phones are going to do is refine on the base set down by the samson. The fundamentals of an audiophile can are all here at a price anyone can buy into. UPDATE: SUPERLUX, The OEM of the Samsons now have a new model called the 668 EVO which apparently keeps the same price, with better build quality and bespoke design rather than imitation. Hopefully I will be receiving one for review soon but from initial reports it seems a no brainer for beginners.